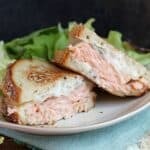 Gorgeous salmon, melty cheese, a little schmere of flavorful yogurt dip, and toasty bread. These are the required elements to give you the Best Salmon Melt. Ever. Place the salmon, skin-side down on a small bake pan (you can line the pan with foil to make cleanup much easier!). Season with salt, pepper, and, generously, Old Bay. Bake at 400F for ~12 minutes until fish flakes with a fork and is just barely cooked through. Remove from the oven and set aside. Put a large, nonstick pan to heat on medium-high heat. Lay out the 8 slices of bread. Spread each bread slice with Greek yogurt dip. Place a slice of cheese on 4 slices of bread. Top the cheese with a piece of salmon. Top the salmon with another slice of bread. Spray the top of the bread with cooking spray. Also spray the heated pan. Place each sandwich in the pan with the side down that was sprayed with cooking spray. Cook until the bread is toasty. Spray the other side of bread (the side up at this point) with cooking spray and gently flip the sandwich to toast the other side. Serve immediately. Yield: 4 servings. If you can't find this dip or something comparable, you can easily make your own. For an example, see #9 on my list of 10 Healthy Snack Ideas for the Workweek.